Splash Financial offers great options for payment flexibility. Pay just $1 per month for up to 84 months while in training. 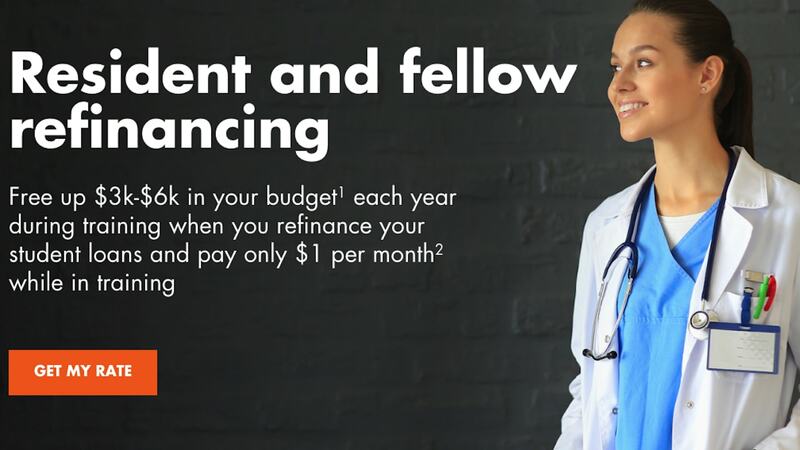 Splash Financial is one of the first student loan refinance lenders to focus heavily on medical student and their loans. Splash Financial offers a fixed interest rate for the life of your loan so you don’t have to worry about your rate increasing. Welcome to Splash Financial. 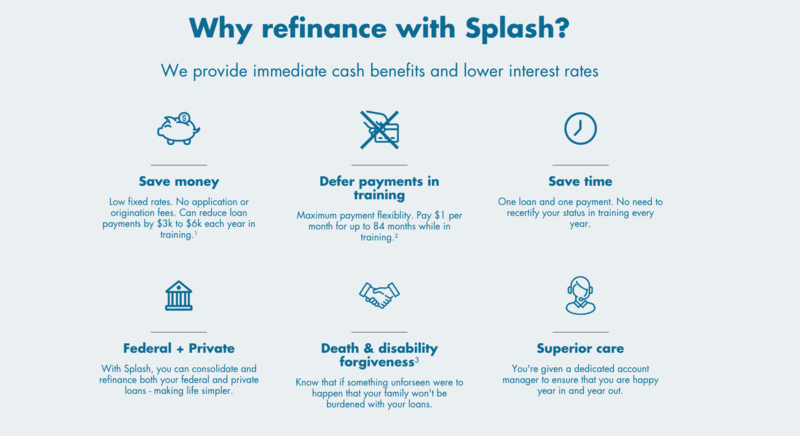 Splash Financial is one of the newest refinancing companies we have had the pleasure of working with. Splash Financial focuses on Medical students specifically regarding both Fellow & Resident’s while they are in medical school. Splash feels that so many students who are in the medical space are paying way too high of interest rates and outrageous monthly payments while many of these students are still in school or training. Splash Financial saw the opportunity to cater to students in this space and created a refinancing product around it. See the great offerings of Splash Financial below. Although Splash Financial maybe one of the newest lenders in the student loan refinancing space, they are packing some incredible punches to make them a top contender for your refinancing needs. 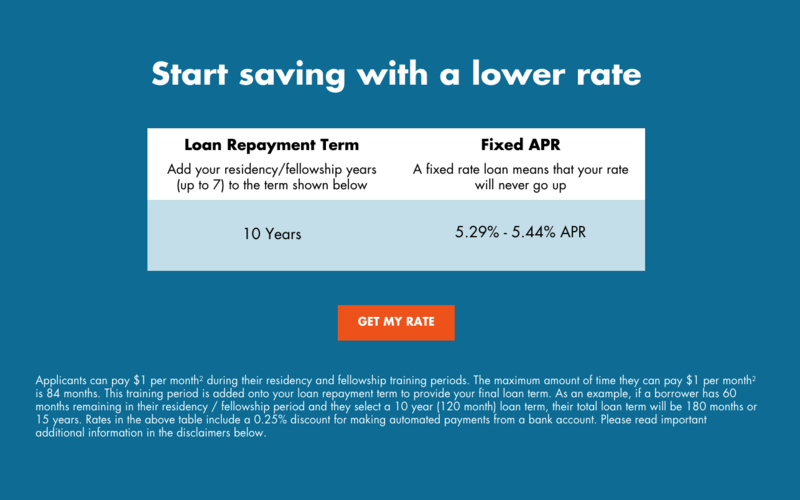 Splash Financial offers the ability for you to refinance both federal and private student loans. Splash Financial is also a great resource to help you save money. 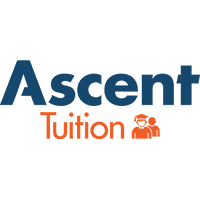 On average they claim to help reduce your loan payments between $3000 to $6000 each year while in training all due to their low fixed rates. Splash Financial offers a few key benefits that separate them from some of the other lenders in the space. These benefits include but are not limited to the following; Splash Financial has no origination or prepayment fees. They offer loan forgiveness in the event of death or total and permanent disability. Additionally, they offer an auto debit discount after training to help you save a small percentage of your monthly payments. Finally, they also offer a deferment option during residency and fellowship of up to 84 months in total. 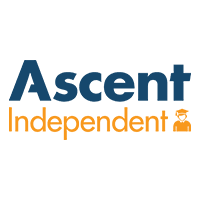 From some of the lender highlights you have seen above, you can clearly see why Splash Financial is one the of the top lenders we recommend on the Student Loan Calculator. For full terms and disclosers head here.